Randolph County was created in late 1828, but it was not until January of 1830 that the county's first elected officers were commissioned and the county started planning for a courthouse. Initially, the town of Lumpkin served as unofficial county seat, with court sessions and other county business taking place in private homes and other locations. In December 1830, Lumpkin served as official county seat for 21 days before being transferred to newly-created Stewart County. One year later, a land lot in the center of Randolph County was designated as county seat (as well as the site of the new town of Cuthbert) -- but the county still had no courthouse. A wooden courthouse was built here in 1837, with that structure replaced by a brick building around 1840. However, in 1845, the legislature authorized Randolph County officials to levy a special tax to build a new courthouse, so the county's second courthouse may actually date to 1845 or 1846. In 1871, the legislature authorized the county to borrow $20,000 to build a new courthouse, subject to voter approval. Apparently, the election failed, for the legislature enacted new legislation in 1883 calling for a referendum to allow the county to borrow $15,000 to build a courthouse. The election was delayed until 1885, and this time voters gave their approval. 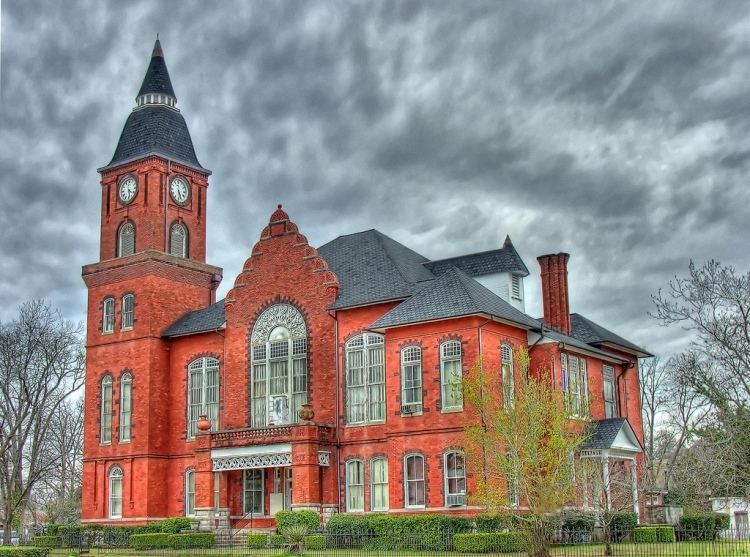 By 1886-1887, when the current courthouse was completed, many of Georgia's counties had recovered from the devastation of the Civil War and had grown wealthy enough to afford "high style" courthouses. One of the favored styles of the period was Queen Anne, a fanciful approach to design. Playful and inventive forms were the rule. For example, on our courthouse tower the roof begins as a pyramid but ends as a cone. Other notable features include the Dutch stepped gable over the main entrance and the ornate Victorian lettering used on the front walls and interior stairposts. The design was the work of architects Kimball, Wheeler and Parkins of Atlanta after the Civil War. For several years he had plenty of work to do there, thanks to a vistor named William T. Sherman.